In the past few weeks we have begun to buy some tickets for the trip. We are waiting until next weekend to do the majority of the buying of tickets, but a few teams we decided to get as soon as we could. The first tickets we got pretty much just because they had them on sale back in January was the Rockies. As expected we had no problem getting handicap seats for their ballpark. About two weeks ago we got the tickets for the Boston Red Sox game. We easily got handicap seats here, too. We were not sure if it was going to be easy, as when we called you could not get any tickets for the game we wanted online except for on StubHub. We ended up with tickets that were handicap and even a little less than the current cheapest for that game on StubHub. This week we got the Cubs tickets. Again we easily got the handicap seats directly from the ballpark. We even got a parking pass for a handicap spot for the game. The Cubs handling of the handicap seats have impressed us the most so far. They do not mail out the tickets. You must pick them up at Will Call and the handicapped person must show a form of ID. Also, for the parking pass you have to give your handicap placard or plate number and will only be able to use the pass with that placard or plate. Both are great policies to help make sure they go to those that need them. The Yankees on the other hand have proved to be a pretty disorganized team in my mind. For one they still do not have a date for when tickets will go on sale. I guess they go on sale right before the season begins. That does not bother me. What bothered us was that the ticket office is convinced that TicketMaster allows you to buy the handicap seats directly through the website just as if you were buying normal seats. Now we have been buying tickets for ballparks across the country online for years and every time we have to fill out a form and then we are contacted to buy the handicap seats over the phone. This year we have been avoiding that since the Orioles never contacted us back after filling out their form and have just been calling the ticket office numbers. Most ballparks always handle the sale of handicap seats, but I have noticed a few still have TicketMaster handle the sales, yet they are still have always been handled over the phone in our experience. I sure hope that that is the case for the Yankees and the ballpark people are just ignorant, as I feel that it is one of the teams that will have people trying to take the seats just to get tickets like the Cubs try to avoid with their policies. 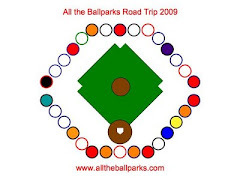 30ballparks-in-1season.com. We have many games in common for the Quest this summer. Would love to meet up with you at some of the games.